There’s something immensely satisfying about planting a tree and watching it grow through the years. 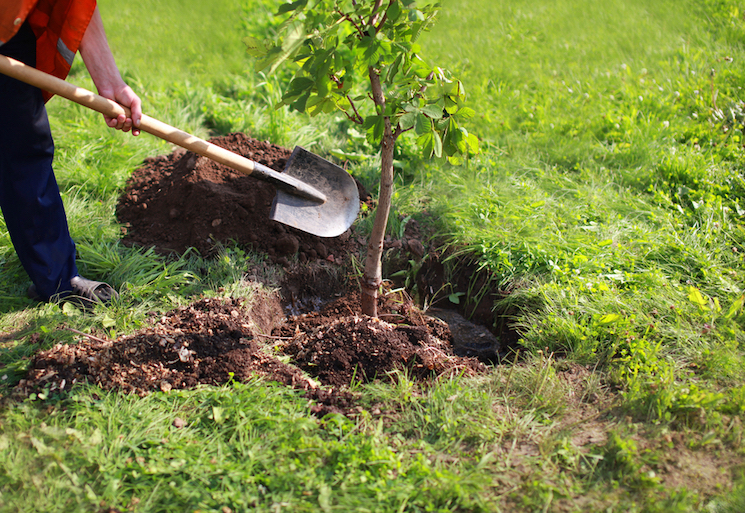 Planting trees and shrubs isn’t difficult, but it’s important you get it right. Give trees the best start by following these basic steps. What’s the best time of year to plant trees and shrubs? 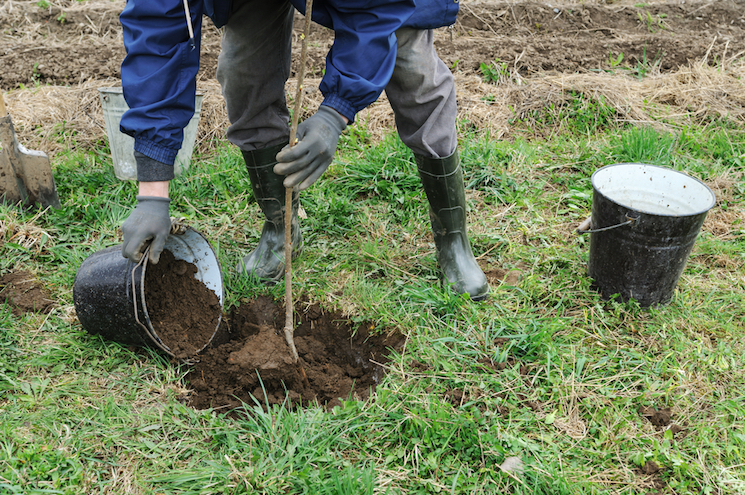 The tree-planting season is between autumn and spring (October-April), when the soil is moist and tree roots are dormant. Avoid planting into waterlogged soil or frozen ground that is too hard to get your spade into. Container-grown trees can be planted out all year long, but they will need more watering in spring and summer. Sticking to October-April planting will make life easier for you and your garden trees. How quickly do I need to plant my tree or shrub? Plant your tree or shrub as soon as possible. 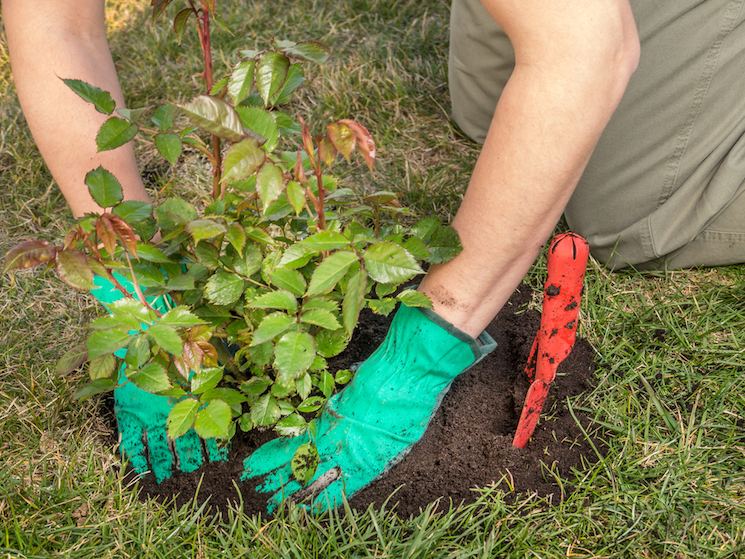 Planting bare-root trees and shrubs (such as bare-root rose plants) should be carried out quickly to prevent dehydration of the roots - although the plastic packaging around your new tree’s roots will keep them alive for a short period (a few weeks, tops). Keep bare-root trees and shrubs somewhere cool, but frost free, until planting. If planting is heavily delayed it may be best to 'heel-in' your plants. 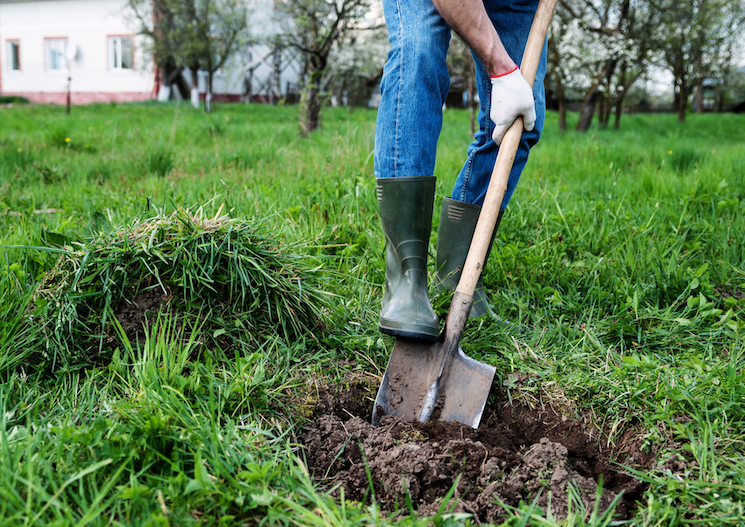 Dig a temporary trench in ordinary garden soil. Cover the roots with soil, firm in and water well. Heeling-in will keep your plants alive until you’re ready to plant them in their final position. Provided your tree or shrub is hardy they can safely remain heeled-in outside for up to 3 months. Container grown trees or shrubs can be placed somewhere sheltered in the garden until you’re ready to plant them. It's vital to give your trees or shrubs the best growing conditions possible. 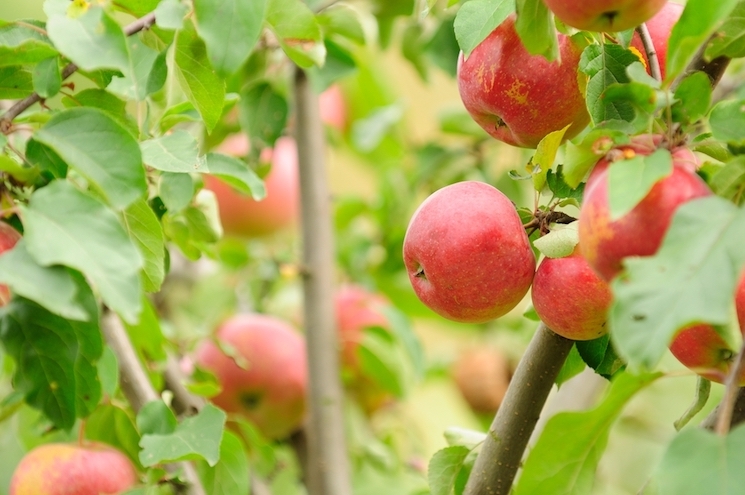 This is especially important when planting fruit trees, which do best in a sunny plot. 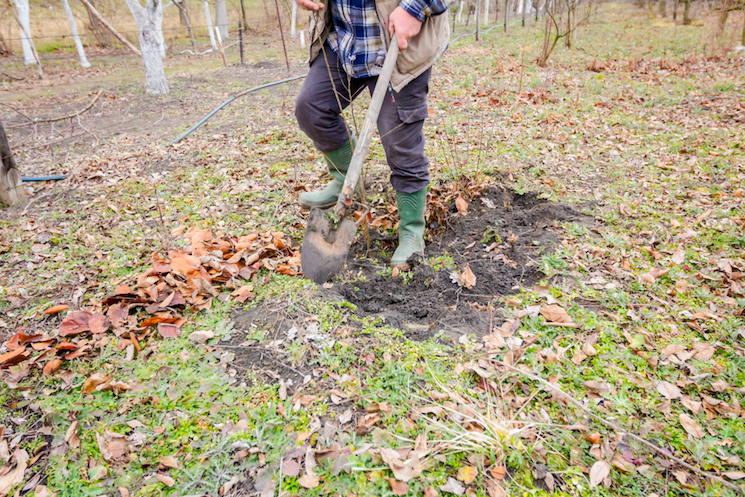 All trees prefer a well-drained site, but if you have heavy clay soil, adding some organic matter - such as compost or well rotted manure - along with grit, will improve drainage. Think about where you will plant the tree in relation to your house. Some roots and branches may spread beyond the boundaries of your property, and trees can sometimes cause structural damage and block drains. Be aware of places where limbs may fall or roots might grow. Also consider the height of any overhead cables. Dig a hole. Your hole should be the same depth as the tree’s root ball and three times as wide. This ensures the roots have plenty of loose soil to grow into. Break up the soil around the sides and base of the hole with a garden fork if it’s compacted. Consider digging a square hole, as it’s easier for roots to penetrate through heavy soils at the corners of the square. Dig over the soil with a garden fork and incorporate organic matter such as well-rotted manure, compost or recycled green waste. Soak the roots. If you’re planting a container-grown tree, soak the compost thoroughly before removing the container (cut it away if necessary). If you’re planting a bare-root tree or shrub, soak the root ball by standing it in a bucket of water. Loosen the root ball. Gently tease out the roots to encourage good growth after planting. Trim off any broken roots with secateurs. However, if you’re planting magnolia or eucalyptus, leave the roots alone - they don’t like to be messed with. Position the tree or shrub in the hole. Put your plant into its hole, aiming to keep it at the same depth it was growing at in the nursery. It's important not to plant your tree or shrub too deep as it will die. Laying a bamboo cane across the top of the hole and lining it up with the top of the root ball (or the dark soil-mark on bare-root trees) is a good way to check you have the correct depth. Simply add or remove soil beneath the root ball until you get it just right. Backfill around the roots. Gently fill the hole with the remaining soil and take care not to leave any big air pockets around the roots. Gently firm in the tree or shrub. Protect the trunk. Wrap chicken wire or a tree spiral around the base of the trunk to protect the bark from nibbling by deer or rabbits. Water and mulch. Water well. Apply a thick mulch (about 5cm deep) around the planting area to prevent weed growth and retain moisture. Keep a collar of about 10cm (4 inches) free of mulch around the woody stem of your tree or shrub to prevent the bark rotting. Stake. A top-heavy tree will need staking to protect it in windy weather. Hammer in a sturdy stake just off-centre inside the planting hole. The top of the stake should be below the first branches of the tree. 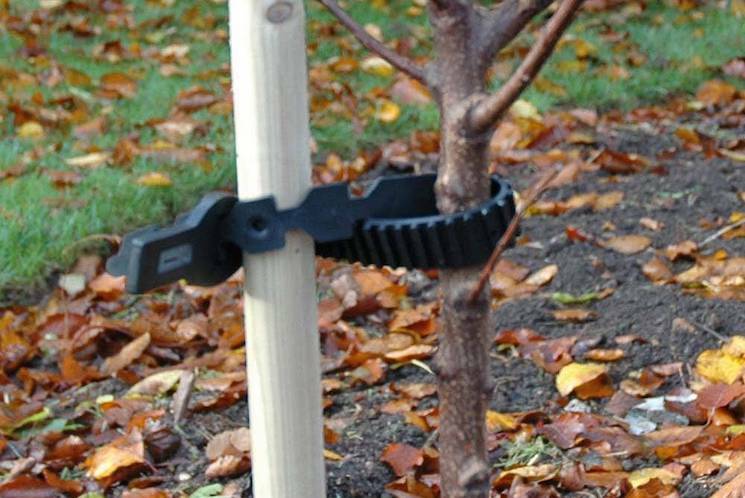 Use a stake tie to attach the tree to the stake after planting. Newly planted trees and shrubs can often suffer from drought stress. Dry, windy weather will cause water loss and, even if the summer has been cool and damp, rainfall might not reach the soil at the roots. 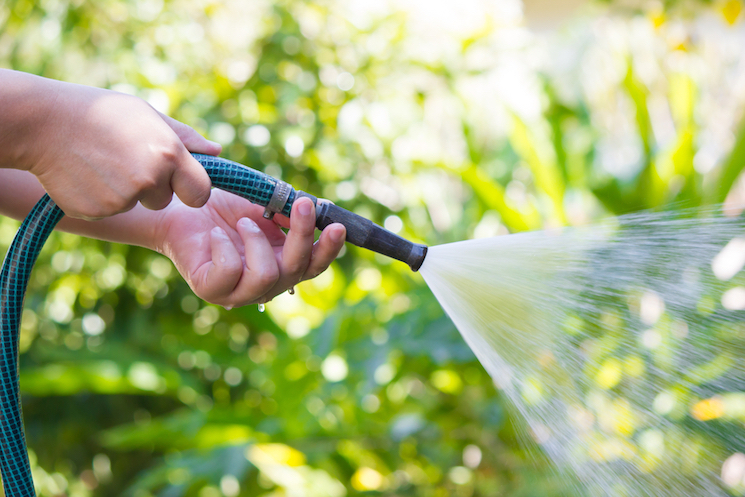 Weekly watering in the dry months will ensure your tree doesn’t get too thirsty. The surest way to check moisture levels is to carefully dig down past the root ball with a trowel and feel the soil with your hands. Any weeds growing around your new tree or shrub will rob it of vital nutrients and water. That’s why it’s important that, for the first three years after planting, you keep the area around your tree or shrub weed-free. Follow these steps and your tree or shrub will be happy and healthy for many years to come.